We’d love your help. Let us know what’s wrong with this preview of Summer of '69 by Todd Strasser. To ask other readers questions about Summer of '69, please sign up. first there was Cheech an d Chong, then Dazed and Confused, Dude, where's my car, the big Lebowski, Seth Rogan ... and now, introducing Sir Lucas Baker of the Round Table(t) lol! Thank you to NetGalley for providing me with an ARC of Summer of '69 by Todd Strasser. I've read and reviewed this copy. All thoughts and opinions are my own. The Summer of '69 is a story about Lucas who has just graduaded high school, said good-bye to his girlfriend who's leaving for camp and has been rejected by a college which results in a very high chance that he'll be drafted for the Vietnam war. The story details how Lucas tries to find a way to not get drafted for the war, while dealing w Thank you to NetGalley for providing me with an ARC of Summer of '69 by Todd Strasser. I've read and reviewed this copy. All thoughts and opinions are my own. The Summer of '69 is a story about Lucas who has just graduaded high school, said good-bye to his girlfriend who's leaving for camp and has been rejected by a college which results in a very high chance that he'll be drafted for the Vietnam war. The story details how Lucas tries to find a way to not get drafted for the war, while dealing with feelings about the war, his relationship and his future. In order to surpress his feelings about all of this, he takes different kind of drugs. Summer of '69 is partly based on the real life of the author which made for an interesting read. I was drawn to the aspects of the character's fear about being drafted for the Vietnam war and the circumstances in that period. Unfortunately, apart from the drafting storyline, the story didn't resonate with me. I felt that the shift between first person and third person was annoying at times, even though it showed the difference between sober Lucas and Lucas on drugs. I couldn't really connect to any of the characters which resulted in me not connecting to the story. I do think that this story might be more appealing to people who know more about the Vietnam war and perhaps the repercussions it's had on people. Being from Europe, I've only read about the Vietnam war in History class in high school, so it's interesting to learn more about it in this way. But apart from that I couldn't connect to it that deeply. I recommend this book if you want to read a story that takes place in the sixties and deals with Woodstock, all types of drugs, the Vietnam war and the fear of being drafted for a war you don't believe in. I did not think I was going to like this book? Right off the bat, I’m not saying it’s the best book ever, but I requested this ARC on a whim because I like the publishing house and I haven’t really read much about the ’60s. A lot of the reviews leading up were talking about the focus on drugs and Disclaimer: I received this book for free from LibraryThing Early Reviewers and Candlewick Press in exchange for an honest review. This does not affect my opinion of the book or the content of my review. I did not think I was going to like this book? Right off the bat, I’m not saying it’s the best book ever, but I requested this ARC on a whim because I like the publishing house and I haven’t really read much about the ’60s. A lot of the reviews leading up were talking about the focus on drugs and for some reason I thought there was going to be a lot of focus on Woodstock. While the drugs were a constant presence, I think Summer of ’69 was mostly about the fear of the future in a time where many people’s future was uncertain. There’s a lot of conversation about the Vietnam War and Lucas trying to get Conscientious Objector status. Like I said, I don’t know much about this era outside of basic popular culture, so hearing about Thomas Aquinas was interesting. I also think it’s worth noting that the book was written by someone who lived through the era and not just a piece of historical fiction based on a lot of research. Despite all the best research, personal experience makes a big difference in the genuine voice of a piece. Lucas as a character really bothered me, but not because he’s poorly written. Lucas reminds me of an ex-boyfriend, of whom I have very cringy memories. Lucas isn’t a bad person, but he doesn’t seem to understand how the world works. Yet, at the same time, he’s very aware of this personal failing, and agrees when other people tell him about it. The character has a lot of blind spots, and he knows it, but he still behaves poorly. He’s a rich white kid and he knows he’s privileged. Whenever the Panthers are brought up, he seems to get uncomfortable, but there’s no blatant racism. I didn’t like Lucas, but I’ve seen people like him. The relationship aspect was what was most uncomfortable to me. Lucas was a heavy drug user without a plan for the rest of his life or interest in really changing. He was a lot of hot air. And I’m not just talking marijuana – the kid was dropping acid all the time with the overture “I’m going to stop soon”. His girlfriend, Robin, is away counseling at camp and expresses that she’s not comfortable with their relationship or the person she is when she’s with him or his constant drug use. She essentially dumps him in multiple letters and Lucas’s response to this is to beg her not to leave him and promise to change and to profess his undying love. It’s like… no matter what she says, it just makes him cling more. From a purely literary point-of-view, I get that Robin is the only thing in Lucas’s life that probably feels stable, but the emotional manipulation is just not okay. Of all his behavior, I suppose it’s weird that I’m latching on to the way he behaves as a boyfriend, but honestly between him begging her to stay while he has a fling with Tinsley… it wasn’t okay. Nothing to do with the writing – I just thought Lucas was a bit of a crappy person. I received this ARC from Candlewick Press with the agreement that I would write a candid and unbiased review. This is, indeed, a very candid overview! Todd Strasser’s story of a summer during the hippie era turned out to be a surprise for me. Some background to my expectations seems necessary, to provide the context for my review of Summer of ‘69: in 1969 I lived in the hippie capital of Canada (Victoria, BC). My experience of embracing the counterculture society of the day was rather different ( I received this ARC from Candlewick Press with the agreement that I would write a candid and unbiased review. This is, indeed, a very candid overview! Todd Strasser’s story of a summer during the hippie era turned out to be a surprise for me. Some background to my expectations seems necessary, to provide the context for my review of Summer of ‘69: in 1969 I lived in the hippie capital of Canada (Victoria, BC). My experience of embracing the counterculture society of the day was rather different (followng a sustainable lifestyle, supporting a socially-active justice system, supporting anti-war protests [we hated Nixon, Dow Chemical and our University’s unenlightened white-man administration], sheltering draft-dodgers, living in a communal house, attending university). Yes, there was a lot of drug use amongst the 20-somethings (marijuana, hash, LSD, mushrooms [Psilocybe mexicana grows rampantly in the Pacific Northwest], the latter two were still legal to possess). But in the mid- to late-sixties, the younger kids in high school were not turning on and getting wasted. That was more a feature of the mid 1970’s, when grass seemed mainstream and a great deal of it grown locally (BC Gold). So my context for the 1969 milieu Strasser describes was somewhat different. Hence, I was expecting something groooovy, man! A story that embraced more flower-power, more social activism and maybe carrying a Haight-Ashbury vibe. Instead, Todd wrote a poignant memoir, albeit somewhat fictionalized (I think), of being in high school, having love-relationship problems, using drugs to escape the realities of living in a sadly dysfunctional family and facing the iniquitous draft. New York was obviously a radically different environment to the softer counterculture-back-to-the-landers group where I hung out on Vancouver Island. Strasser's narrative swept me back to the era of Nixon, the relentless draft of kids too young to ever be forced overseas and the horrors of ‘Nam. I relived the memories of some sad and some very resilient draft dodgers. I’d forgotten the hilarity of post-weed munchies and how we loved a music scene that was so vibrant. So, yeah, it was a book both of memories as well as gaining some inside knowledge ~ horrors detailed in Chris’ letters from the war zone and what Lucas had to cope with in his young life. Lucas’ plans for the summer are simple: hang out with friends, smoke some weed and take some pills along the way. His plans go off track when he finds out that he did not get into college. He is now at risk of being drafted and sent to the Vietnam Conflict. Also, his girlfriend is spending time in Canada and his friend Tinsley wants to practice her free love by temping Lucas to cheat on Robin. If his life wasn’t crazy enough it looks like his parents might be getting a divorce and his friend in Lucas’ plans for the summer are simple: hang out with friends, smoke some weed and take some pills along the way. His plans go off track when he finds out that he did not get into college. He is now at risk of being drafted and sent to the Vietnam Conflict. Also, his girlfriend is spending time in Canada and his friend Tinsley wants to practice her free love by temping Lucas to cheat on Robin. If his life wasn’t crazy enough it looks like his parents might be getting a divorce and his friend in Vietnam is in constant danger. What will Lucas do to avoid ‘Nam? What else will life throw at him? This book was wrote to celebrate the 50th anniversary of the Woodstock festival which the author attended. The author has done such a brilliant job of capturing a place and time in history I felt as though I was there myself. The book centre’s around the life of a young hippie named Lucas who has just come of age and is facing the difficult question what he should do with the rest of his life. He is living in a society of great social divide due to the political issues caused by the war in Vietnam. All through out the book we feel the impending doom that Lucas feels about the possibility of being forced to join a war that he is against which is a very important element of the story. We also get to experience through Lucas how causal drug use was at that time and how glamourized the idea of free love has become because of that fateful Woodstock festival in 69. Through Lucas’s journey I learnt so much about a period of history that I didn’t really know about and enjoyed the story in general. I strongly recommend to those who are looking to read something a little bit different. I was lucky enough o receive a free advance copy of Summer of 69. I am writing this review not ten minutes after finishing the book. I had a hard time putting it down. I especially liked the way he wrote about the drug use in the book. not only was it accurate in the experience, but he rode the fine line of neither outright glorifying nor condemning it, but rather portraying it as it really is used and how it was for Lucas - an escape. As someone who did not live through that era, but loves a l I was lucky enough o receive a free advance copy of Summer of 69. I am writing this review not ten minutes after finishing the book. I had a hard time putting it down. I especially liked the way he wrote about the drug use in the book. not only was it accurate in the experience, but he rode the fine line of neither outright glorifying nor condemning it, but rather portraying it as it really is used and how it was for Lucas - an escape. E-ARC kindly provided by the publisher. "Here we come, three degenerate hippie freaks in a psychedelically painted microbus. If I were a border guard, I wouldn't be wondering if we were carrying drugs. I'd be wondering what kind of drugs and how much." Let me preface this review by saying that now knowing how heavily this book draws from the author's personal life, I feel slightly terrible for thinking the things I do. Heh. Anyway, I literally mean no E-ARC kindly provided by the publisher. Let me preface this review by saying that now knowing how heavily this book draws from the author's personal life, I feel slightly terrible for thinking the things I do. Heh. Anyway, I literally mean no offence and I read this book as a fictional story about some real events rather than as a a semi-biographical story of someone's life (I only found out at the end of the book that it, in fact, was semi-biographical). Anyway, moving on. Gathering my thoughts about this book is difficult. As for the actual plot, I liked most of it but what mostly threw me off was....the main character. I found him to induce a headache in me, and I could never fully get past my dislike for him. In this book you're following Lucas. The year is 1969, Lucas is a 'longhair' who tries to avoid being drafted for the Vietnam war, tries to avoid breaking up with his girlfriend, Robin, and who also, it seems, tries to do as many drugs as possible. All in all, I rather liked this book. I am a self proclaimed lover of history and historical fiction and I prefer stories set in a relatively recent time. I have to admit that the 1960s (and 1970s) are somewhat of a black hole for me when it comes to my knowledge of history and simply because of that I found this book very interesting. I liked taking part in historical events and getting to be a fly on the wall for Woodstock. All in all, there was something that made me go "ah, just one page more" every time I picked this book up, and I feel like that something probably was how unpredictable this book was! There was always something potentially bad lurking on the next page, which kept my interest up and made me want to keep reading. I think this book also managed to balance heavier topics with the carelessness of summer very well; I really enjoyed that. Now, I've already mentioned my dislike for Lucas as a character but let's dwell into it further, shall we. I mean, Lucas is 18. That definitely is an explanation as to why he's constantly being incapable of taking care of himself and being in charge of his own life; he's pretty much a child still. Sure, he has an awful situation at home AND he has the threat of being drafted for the war hanging over him. On top of it he's heartbroken. I sympathize for him, I really do but at the same time I can't do it. He's irresponsible (see: his mother writing college applications for him because he can't be bothered to do it himself), which could be blamed on his tender age but still. He does a lot of drugs (I'm not going to go into whether he should/shouldn't do that, that's besides the point), his girlfriend puts an ultimatum on him to change his habits of using drugs and his response to that is simply "eh, I'll just cut back a bit" and he thinks that's enough. Which honestly, is not trying hard enough. When things naturally go bad for him due to his lack of care, he just complains about it and doesn't really do much. Granted there is *some* character development on his part but not a lot honestly, and that bothers me about him as a character. What I'm saying is, you can't be irresponsible and then complain that your life isn't going well. The slight character development I saw was tiny because ultimately, in the end, other people kept saving him and thus moved the responsibility he has over his own life away from him. - the way this author changes tenses, from first person to third person. It took me quite a while to realize why he did it like this and while I get the stylistic use of tenses in this book, I didn't like it. It sort of threw me off and I had to take a moment to get into the book again. - same goes for the use of adjectives in the "Lucas the x" type of way, like "Lucas the confused". I got tired of that pretty quickly. - this book also at times felt like it was telling the plot more than it was showing it, which sadly is something I easily notice because I have a strong personal preference for the latter way of telling stories. - the way women (mainly Tinsley but also Robin to a slight extent) sometimes were portrayed as pretty objects with the ability to fulfill Lucas's life. The way Tinsley never really got a personality but only ever functioned as a tempting object who was trying to lure Lucas away from the safety of Robin rubs me the wrong way. I would have loved for her personality to have been developed more; same goes for Robin, honestly. I have always been interested in the 60s and I am especially a fan of the music from that era. One of the reasons I requested this book was because one of my favorite songs is Summer of 69 by Bryan Adams, haha. That song was of course written in the 80s, but it was about a life in the 60s. 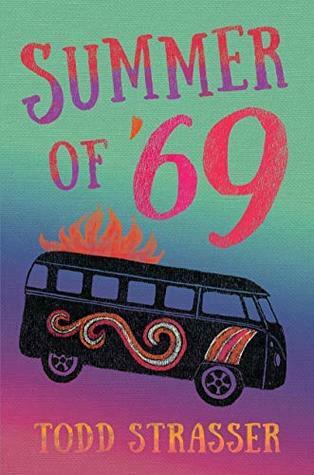 That time period just seemed so fun from things I’ve read, listene I received an ARC of Summer of ’69 from the publisher via Netgalley in exchange for an honest review. It will be released tomorrow (April 9th). I got my Advance Reading Copy from a giveaway on LibraryThing. It took me a little while to get into this book. Thinking of it as "memoir" at first I really disliked the main character. Spoiled rich white boy from New York City trying to dodge the draft, getting stoned, and not getting the grades to get into college. Not much interest there. I stepped back though and read the back of the book and revised my thinking. It's not "memoir". It's "historical fiction". With the mindset of "historical fi I got my Advance Reading Copy from a giveaway on LibraryThing. It took me a little while to get into this book. Thinking of it as "memoir" at first I really disliked the main character. Spoiled rich white boy from New York City trying to dodge the draft, getting stoned, and not getting the grades to get into college. Not much interest there. I stepped back though and read the back of the book and revised my thinking. It's not "memoir". It's "historical fiction". With the mindset of "historical fiction" of course the main character is a little too heroic to be believed. "Tinsley" is not a real person. She may have been a conglomerate of several women or she may never have existed at all. The author notes in the back of the book that a trip he took to Canada and his trip to Woodstock were with different women. So this book IS fiction. However it gives us an insight to what was going on in Middle Class America in the summer of '69 as far as Viet Nam goes and Woodstock and the beginnings of the hippies in New York City. Lucas didn't win me over, even in the end. My copy of the book had typos that may never be caught before this book goes to press (There's a Cat in Hat reference that got messed up). There's no sense wondering what happened to "Alan", "Chris", "Milton" or anyone else because the book is fiction. Todd is trying to tell a love story here between Lucas and Robin maybe, but I don't buy the "happily ever after ending" that he gave them. The 60s: the decade of space travel, mindless wars, and the best music to ever pass through mankind’s ears (*cough* Creedence Clearwater Revival *cough*). The good, the bad, and the ugly. Through it all, one thing always remained with those who chose to live it: free love. So, naturally, when I saw Todd Strasser’s novel, “Summer of ‘69” advertised on the Amazon shopping page I immediately added it to my cart, my GoodReads “Want to Read” list, and Net Galley request form. The anticipation for this The 60s: the decade of space travel, mindless wars, and the best music to ever pass through mankind’s ears (*cough* Creedence Clearwater Revival *cough*). The good, the bad, and the ugly. Through it all, one thing always remained with those who chose to live it: free love. So, naturally, when I saw Todd Strasser’s novel, “Summer of ‘69” advertised on the Amazon shopping page I immediately added it to my cart, my GoodReads “Want to Read” list, and Net Galley request form. The anticipation for this read was excruciating, and when I finally got my hands on it you best believe that I DEVOURED it in one sitting. You better buckle up, folks, because this book is a wild ride. The author did a very good job in capturing the feeling and mood of the era. I would know, I was about 20 or 21 back then. Yeah, I'm old. I was serving an apprenticeship, as a painter, schools, churches, offices and such. The job was deemed as "vial to the country's best interests". I was able to obtain a deferment for the apprenticeship, which kept me out of Vietnam. The laws and rules weren't very fair, but I just followed them. The majority of draft age guys back then were desperately looking The author did a very good job in capturing the feeling and mood of the era. I would know, I was about 20 or 21 back then. Yeah, I'm old. I was serving an apprenticeship, as a painter, schools, churches, offices and such. The job was deemed as "vial to the country's best interests". I was able to obtain a deferment for the apprenticeship, which kept me out of Vietnam. The laws and rules weren't very fair, but I just followed them. The majority of draft age guys back then were desperately looking for a way to beat the draft. I enjoyed the book and the characters. Read it, especially if you were young back then. This book is really not my speed at all. I just can't get past the writing style, it feels very elegiac. I am also really, really, not into drugs at all. I hate reading about drug use. To be clear I believe we need more proper and positive rep of recovery and I can read those stories. I just don't hold with reading about drugs being the norm or even "healthy". To be fair I have only read about 30 pages of this book. It may be just what someone else needs/wants to read. This book is exhausting with stress for the unknown, both for the character and as a reader. Enduring that as a draftable teenager was too much, both for children and parents. As a reader, the switch between first and third person was too disconcerting, and I know the alternating voice was a tool. But it was distracting and interrupted the story flow. I needed no more stress than necessary while reading this incredibly difficult story. A thoughtful tale of youth. Despite the main character's flaws we want things to work out for him in the end. A mix of summer love, drugs, and rock and roll but not sugar coated by the free love era. There are consequences and our characters face them in varying degrees.